Dublin! | Hit the road, Jac! 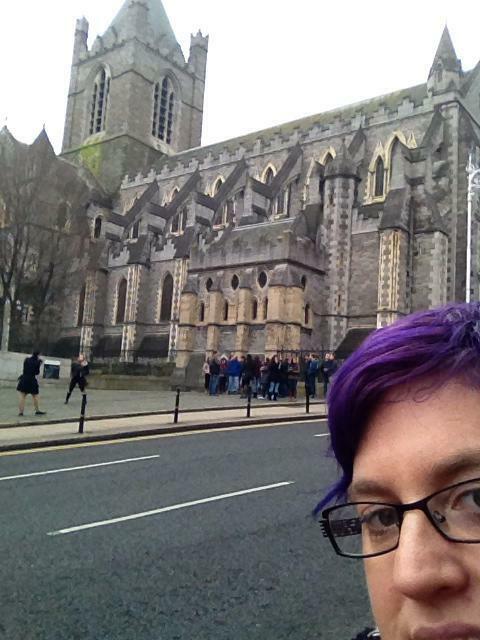 Greetings and Salutations from Dublin, Ireland. ‘Tis verily the city of pubs! I really like this city so far. Yesterday we enjoyed a lazy morning of checking Facecrack, sleeping and coffee. We hit the town just after lunch. Niamh lives in Ballsbridge (teehee!) which is Dublin4 which I am assured is a very lovely area to live in. It is around a 15 minute walk from what seems to be the centre of Dublin. We strolled up the streets to the bus stop, me sighing and oohing and ahhing at the gorgeous Georgian houses, one of which Oscar Wilde was born in. We hopped on the sightseeing bus and took off on a tour of the city. I am quite sure the driver was drunk. Niamh thinks he was putting it on for a craic but Lewis and I are less certain. He was hilarious! He was slagging off the tourists behind their back, complaining about how much people were actually hopping on and off the hop on hop off bus, and making bad jokes aplenty. “What is the difference between Bono and God? and so on. It was a good laugh. We stopped for coffee and then walked through the party district of Temple Bar. 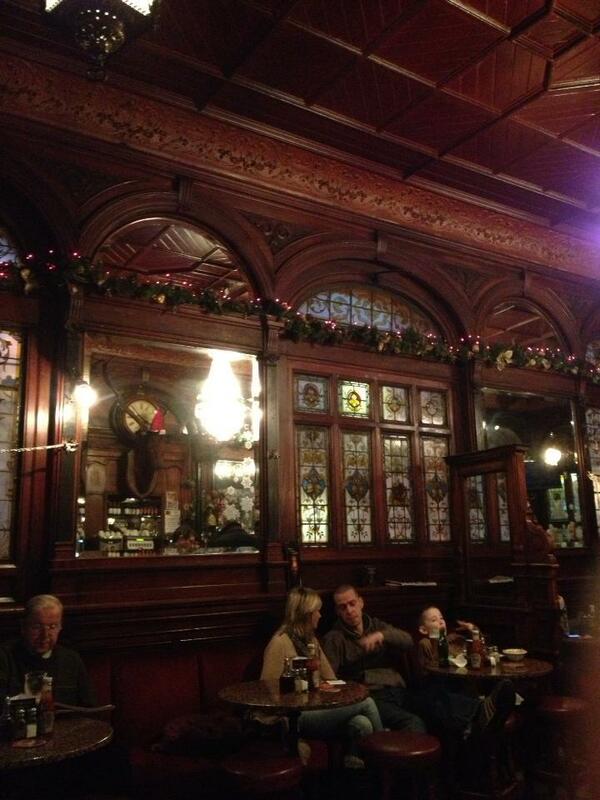 I had requested a look at a traditional Irish pub so we went to The Stag’s Head which was established in 1895. We continued our walk through the city as the sun set (4.30) and found ourselves quite parched so Lewis suggested another pint. We then strolled home through the simply stunning streets. I am fascinated by the houses here, especially the Georgian buildings with their coloured doors. The Christmas decorations just add an air of magic to the place. This morning Niamh put on one of the best breakfasts I’ve ever had! Fresh fruit salad with honey Greek yoghurt and muesli. Yum! We walked back into town and hopped on another bus. This one’s driver was much more sedate so I learnt a little more about the town. We alighted the bus at Christchurch. This cathedral just takes my breath away. Next door to the cathedral is the Dublinia Exhibition of Viking and Medieval Dublin. Very good exhibition I thought. After learning about Vikings (most of which I already knew from teaching it which was quite gratifying!) and Medieval Ireland we walked to The Brazen Head, the oldest pub in Ireland. There we had lunch before catching a cab to the station.Niamh wanted to show me just how close to the ocean Dublin is so we caught the ‘dart’ (train) to the ocean suburb of Dalkey. We wandered through the town and had a coffee in a little cafe on the main street. On the way home we stopped off for a pint, a common Irish/Welsh (Lewis) practice it seems! Tomorrow we are heading off to Belfast for the night. We heard on the news that there are violent protests taking place but Lewis and Niamh aren’t worried. I am doing really well energy wise until around this time (8pm), when my eyes become heavy and I could easily go to bed. During the day I’m taking in so much, looking at everything, learning about the places I’m seeing and just walking a lot. I have a bit of pain in my back and shoulders but really, I’m very impressed with how my body is keeping up! This entry was posted in Uncategorized and tagged Dublin on January 5, 2013 by jacaleee.